How are you doing? I'm so happy my first wall is a huge success :) actually I can't believe it. I had really fun to vector Nunnaly. I know everyones like C.C and Lelouch. There are lot of walls en vectors in MT. C.C is also my fav, but I like Nunnaly too. Now about the background :D I'm really happy I choosed for the background. I have several ideas for this vector. I think this is the most suited for Nunnaly. The bg is also my idea, same as my first wall: ' Hane wo Sagashite ' Hope you guys like it too. That's it. I'm going to sleep now. It's getting late. Such quality :D Lovely job. The lighting is flawless, and that background looks great! Great job! You're certainly a waller to look out for ^_^ Keep it up! nunally look so beatiful this sweet wall! of it all. Cute title as well, fits her. Oh,this wall looks so nice...the background is really great! Keep up the good work,tsuki-san! I really like the background you've chosen. Besides its nice colors, it matches her image perfectly. And the vector is very neat too. And, again, I'm looking forward your next pieces! btw congrats on second elite and keep it up! So much beauty and awesomeness in this vector. Nunnaly's cuteness is increased to the max. Nunally looks really pretty here. I've been meaning to comment on this! 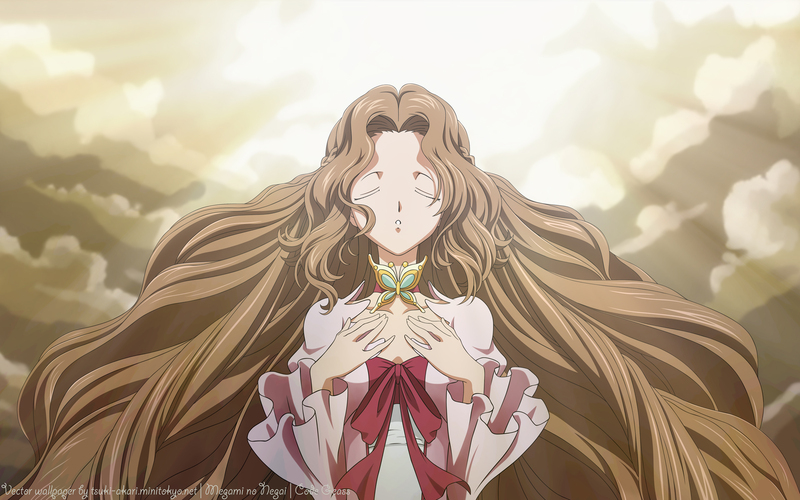 While I feel we can do with a little less gallery items from Code Geass, I can't help but LOVE your vectoring. The line art is very neat and the background + lighting are awesome! Nicely done! I like how the sky's color goes with her hair! Although it might make the wall a bit monotone? But it's still a nice picture!